How could you resist a title like that one? 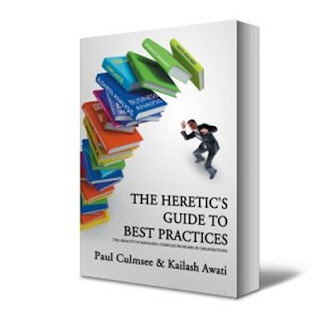 Australian bloggers Kailash and Paul wrote an outstanding book on the perils of Best Practices. This books roots are in complexity thinking, and comes thick with both stories from the field and academic, all integrated with an amusing and entertaining. I highly recommend the book. I even wrote a review on Amazon. To help you take action, links to the physical and kindle editions are below. I just found another blog review on the book as well. Check out McCrick's review here. And here is another review by Shim Marom at Quantum Leap.